International logistics is complex, with large amounts of documentation needed to trade information efficiently across a supply chain. Freight forwarders, Ground Handling Agents (GHAs), and air carriers require solutions to automate the air freight shipment process, easily capture relevant data and store documentation. Freight forwarders use Descartes webDocs to help improve freight booking processes, send electronic waybills and ensure that freight messages are distributed directly to the carriers. Descartes gives forwarders access to an electronic web form that enables them to quickly create various documents and electronic messages. The solution can easily create messaging documents such as Master Airway Bill, House Airway Bill and labels, and send these documents electronically to the airlines. GHAs also use Descartes webDocs service to create the various electronic messages required by an individual airline in a single solution. 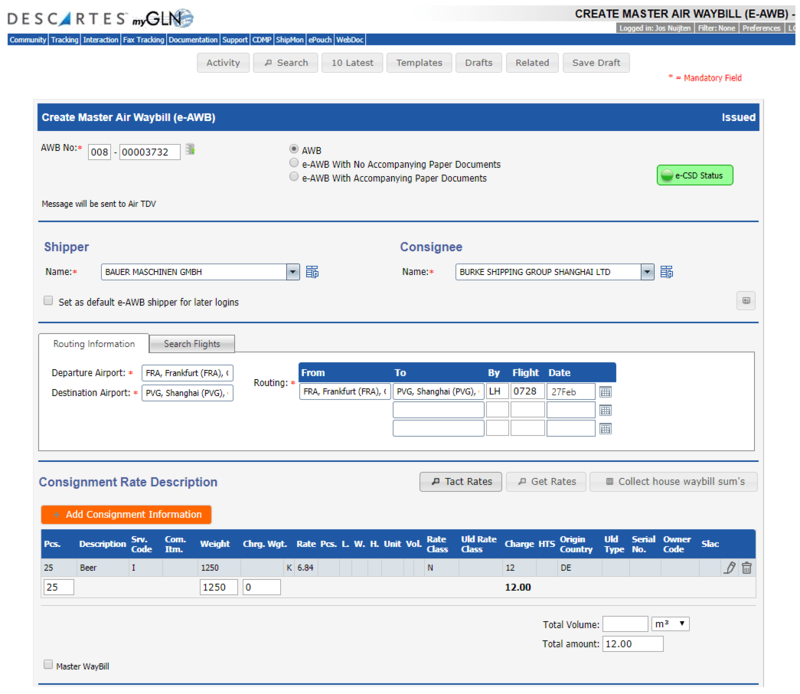 Airlines can leverage Descartes webDocs as an accessible tool from their websites to provide consolidated forwarder connectivity. Together with the International Air Transport Association (IATA), Descartes webDocs offers instant access to global air cargo rates. IATA TACT Web Services (IATA TWS) allows freight forwarders and GHAs to instantly and securely retrieve the most up-to-date rates with an automated web service request. IATA TWS helps to request and instantly transfer only the rates needed directly into operational IT systems. In addition, accounting systems can use the IATA TWS solution to validate shipments with automatic rate checks on the air waybill. Forwarders can use the technology to link the solution to a Transportation Management System (TMS) to automatically and instantly add rates to air waybills. Used by more than 70,000 air cargo professionals worldwide, TACT is the most comprehensive global rates database in the industry. The solution is available in a variety of formats such as print, data flat-file or online application. Descartes webDocs leverages the power of the Descartes Global Logistics Network™ (Descartes GLN™), the standard for multimodal, inter-enterprise electronic data and document exchange. The Descartes GLN connects thousands of shippers and Logistics Service Providers (LSPs) with a broad range of carriers, and provides the connectivity necessary to gain visibility into air and ocean cargo logistics activities. Users can seamlessly tap IATA TACT Rates services from within the familiar, Descartes webDocs solution. Rates are automatically integrated into the AWB. Prevent human error – Improve accuracy and consistency with automated rate extraction. Speed up shipment processing – Up-to-date rate extraction allows businesses to forego lengthy search processes. Standardize information – Ensure that all members of the supply chain work from the same data source. Helping carriers, forwarders and GHAs effortlessly move to the electronic airway bill. Request a demo. Quickly learn how Descartes webDocs can help you easily begin launch the eAWB at your operations.